DeWitt revisits one of its leading models, the Seconde Retrograde by offering a more classical and refined version that comes in a limited edition of 88 pieces. The Seconde Retrograde is presented in a slightly thinner Twenty-8-Eight case, conveying a great impression of lightness. The contrasting mix of 18k rose gold together with grade 5 Neotitanium produces an effect of classicism tempered with innovation, in line with the Manufacture’s identity. The alternating brushed, polished and micro-blasted finishes on the bezel and the case create a subtle play of light. Furthermore, the size and relief of the different guilloché areas gives the galvanic black dial a fascinating depth of colour. As a result, the dial of the Twenty-8-Eight Seconde Retrograde catches the light with every movement of the wrist, recalling the luminous rays of the sun. The Twenty-8-Eight Seconde Retrograde is powered by the Calibre DW1102. Its frequency of 28,000 vibrations per hour gives it a very high degree of precision that, together with its solid 40-hour power reserve, ensures this model will appeal to all lovers of exceptional mechanical watches. Case: Round, with DeWitt Imperial columns on sides and bezel. Polished and micro-blasted finishes. 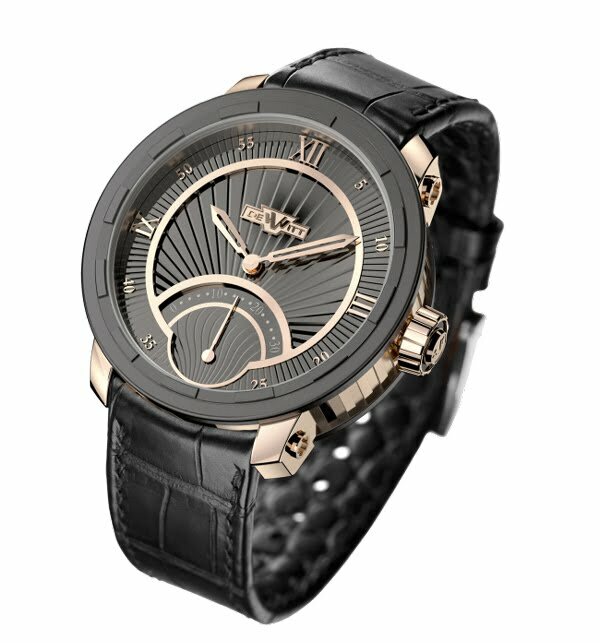 Dial: Centre and exterior retrograde circle in galvanic black with guilloché flames. Rose gold applique circles and numerals. Large Roman numerals at four compass points and small Arabic numerals at five-minute intervals. Hands: Hours and minutes: open-work hands in the shape of two-edged swords. Retrograde seconds two thin, elegant hands. Buckle: Pin buckle in grade 5 Neotitanium with an engraved “W”.